WHERE DID THE IDEA for Carpentaria originally come from? I don’t remember exactly. A friend once said to me while we were looking at the Gregory River in the Gulf of Carpentaria that the white man had destroyed our country. He pointed to the weeds growing profusely over the banks—burrs, prickles and other noxious introduced plants grew everywhere. It would take decades to eradicate the past decades of harm to this otherwise pristine environment. Tangling invasive vines grew here and there, smothering the slender young trees that are indigenous to this savannah-zoned country. What he said was true, but what I saw was the mighty flow of an ancestral river rushing through the weeds, which were only weeds fruitlessly reaching down into the purity of this flowing water. The water rushed past the natural vegetation of ancient paperbarks, palms and fig trees that lined the river bank, and through the ancient serpentine track it had once formed while it continued racing forever forward, coursing its way to the sea. The river was flowing with so much force I felt it would never stop, and it would keep on flowing, just as it had flowed by generations of my ancestors, just as its waters would slip by here forever. It was like an animal, very much alive, not destroyed, that was stronger than all of us. The river reminded me of the Rainbow Serpent that travels throughout the country and across our traditional lands. Perhaps my seeing his skin sparkle in the clear bright sunlight over the Gulf was a present from the country. Perhaps it was then, at that moment, realizing the largeness of standing where countless generations of people whose ancestry I share would have left their footprints, that I decided I wanted to return something of what I have learnt and to continue the story of this country of my forefathers. So in a very small way, I would like to think that Carpentaria is a narration of the kind of stories we can tell to our ancestral land. For a long time while I was exploring how to write Carpentaria, I tried to come to some understanding of two principal questions: firstly, how to understand the idea of indigenous people living with the stories of all the times of this country, and secondly, how to write from this perspective. The everyday contemporary indigenous story world is epic, and although not entirely answering my questions, I feel comfortable in saying that our story world follows the original pattern of the great ancient sagas that defined the laws, customs and values of our culture. The oral tradition that produced these stories continued in the development of the epic stories of historical events, and combining ancient and historical stories, resounds equally as loudly in the new stories of our times. Thinking about our stories in this way helped me to decide that Carpentaria should be written as a traditional long story of our times, so the book would appear reminiscent of the style of oral storytelling that a lot of indigenous people would find familiar. I hoped that the style would engage more indigenous readers, especially people from remote locations, to be readers of this book either now, or in the future, or perhaps at least, to be able to listen to a reading of the book. All the time I was writing Carpentaria, I felt that I could not afford to waste time writing books while there continues to be so much urgent work to do in our communities amid the deterioration and destruction of Aboriginal culture. This argument about guilt over taking time out to write I was having with myself was played out with another argument: If I was to write this book, I knew I had to do it right and it would take time. I wanted the novel to question the idea of boundaries through exploring how ancient beliefs sit in the modern world, while at the same time exposing the fragility of the boundaries of indigenous home places of the mind, by examining how these places are constantly under stress and burdened with threat, and often forced into becoming schizoid illusions of our originality. I wanted to examine how memory is being recreated to challenge the warped creativity of negativity, and somehow becomes a contemporary continuation of the Dreaming story. The fundamental challenge I wanted to set myself was to explore ideas that would help us to understand how to re-imagine a larger space than the ones we have been forced to enclose within the imagined borders that have been forced upon us. Most of all, Carpentaria was written with the desire to create a work of art. Every word and sentence was worked and reworked many times to give authenticity to the region and to how people from that region with bad realities might truly feel and dream about impossibility. This authenticity, of how the mind tries to transcend disbelief at the overwhelming effects of an unacceptable history, could be understood as bipolar: it’s there and not there. When faced with too much bad reality, the mind will try to survive by creating alternative narratives and places to visit from time to time, or live in, or believe in, if given the space. The novel is narrated by replicating the storytelling voices of ordinary Aboriginal people whom I have heard all of my life. At the same time, I have been fortunate to have worked for a long time with some of our most brilliant indigenous creators of stories from across the country. I have also been very lucky because wherever I go, other indigenous people know I am a writer, and they have liked to tell me stories, and because it is obvious I really like stories, we have devoted many hours in the day simply to enjoying each others’ stories. I was often told as a child not to listen to my grandmother’s stories as she was filling my head with rubbish. I have since learnt that these are stories of spiritual beliefs as much as the beliefs of the everyday. It comes from the naturalness of being fully in touch with the antiquity of this world as it is now, and through this understanding, an enabling, to understand more broadly the future possibilities. These stories are about having a belief system and principles of the right and wrong way to live. It is these things that have firmly stood by the oldest race of people on earth and allow many of our people to uphold the country and care for the land. I have had to deal with history all of my life, and I have seen so much happen in the contemporary indigenous world because of history, that all I wanted was to extract my total being from the colonizing spider’s trapdoor. So instead of picking my heart apart with all of the things crammed into my mind about a history which drags every Aboriginal person into the conquering grips of colonization, I wanted to stare at difference right now, as it is happening, because I felt the urgency of its pulse ticking in the heartbeat of the Gulf of Carpentaria. Just so! In such a scenario, and without settling for one explanation for the novel while others can be imagined, Carpentaria is the land of the untouched: an indigenous sovereignty of the imagination. Just such a story as we might tell in our story place. Something to grow the land perhaps. Or to visit the future. Alexis Wright is an award-winning author from the Waanji people from the highlands of the southern Gulf of Carpentaria, Australia. 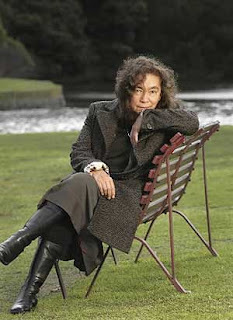 She will be appearing at the 2008 Ubud Writers & Readers Festival on October 14-19, 2008.